Wool is one of the oldest textile fibers used by humans. The term wool is generally used to describe fiber obtained from sheep or lambs. Legally the hair of a few other animals can also be called wool because its qualities are similar to sheep's wool. The United States government allows the fiber from alpaca, camel, llama, vicuña, Cashmere goat, and Angora goat to be labeled as wool, but these can also be labeled by their own fiber names. Sheep were first domesticated in Central Asia about 10,000 years ago to provide a ready source of meat, milk, and hides for clothing. As humans worked with the hair from the sheep hides, they found that twisting thin strands of wool fiber together forms a continuous length of yarn. As time went on, they discovered that interlacing the yarn would form a fabric. Once yarn and fabric production were part of the knowledge base of humans, fabric became a second skin. The oldest surviving fragments of wool cloth were found in Egypt and date between 4000 and 3400 B.C.E. The early, wild species of sheep had a two-layer coat. The coat closest to the body was a short wool undercoat of fine, downy fiber. This was protected by long, coarse and straight guard hair. Since some sheep had better-quality fiber than others, people selected sheep for breeding that provided more undercoat and less guard hair. In the early 2000s, the majority of sheep growing wool for clothing produce mainly undercoat fiber. A wool fiber is made up of three layers: the cuticle, cortex, and medulla. The cuticle is the outer layer of over-lapping scales that comprises about 10 percent of the fiber. The cortex provides the bulk of the fiber, about 90 percent, and is composed of millions of long cells held together by a strong natural binding material. The cortex has two types of cells that behave differently to give wool fiber the characteristic "crimp" or waviness when a fiber is viewed from the side. The medulla, when present, is found in the middle of the cortex, and is a latticework of air-filled cells. A fiber with a large medulla is weak and doesn't dye easily. When human beings first used wool fiber, they gathered fiber that was shed from the sheep during their spring molt. As humans domesticated the sheep, they bred them to resist shedding so that the wool could be removed when it was convenient. In the early twenty-first century, the first step in wool production is removing the wool from the sheep by shearing (cutting). Once off the animal, the fleece of one sheep is bundled together with the clean side in. Technically, hair differs from wool. Hair is a coarse and straight fiber, whereas wool is a fine and crimpy fiber with a scaly surface. Fur fiber describes the hair of any animals other than sheep, lamb, Angora goat, Cashmere goat, camel, alpaca, llama, and vicuña. If hair or fur fiber is attached to the animal skin, it is also referred to as fur. The coat of fibers from one sheep is called a fleece. Each fleece is examined, graded, and sorted. The tangled and dirty parts of the fleece are removed and the fleece is graded for fiber fineness (diameter), length, crimp (a uniform waviness), color, kemp (thick hair fibers that dye poorly), strength, and elasticity. The finest wool's diameter is between 10 and 20 microns (one micron equals 1/20,000 of an inch). 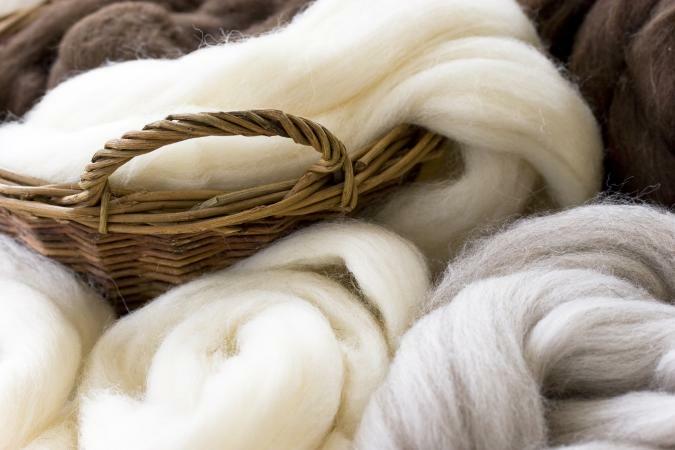 Fine wool is soft, like the fiber in a cotton ball, and is most luxurious. Coarse wool tends to be stiff and bristly, making it best for carpet. The length of wool fiber varies from 1 to about 14 inches. Fine combing wools measure 2.5 inches or more in length and coarse wools around 1.5 inches. While there are as many colors of sheep as there are colors of dogs and cats, white is the most common and has been the most valued over time. Sorting separates the individual fleece into various qualities, with the shoulders and sides giving the best quality and the legs the lowest quality. Wool needs to be cleaned of natural impurities before it is processed further. Impurities include a greasy substance called lanolin that oils the wool fiber and helps the sheep's coat shed water. Other impurities are dirt, vegetable matter, and perspiration or suint (pronounced swint). The wool is scoured by washing it with a detergent solution that carries the oil and dirt away from the wool. If some of the lanolin is left on the wool fibers to provide water repellency, it is called grease wool. Sorted fleeces of a particular quality are thor-oughly mixed together, in order to obtain a desired consistency of wool quality. Other types of fibers, such as spandex or nylon, may be added during this step to achieve an intimate blending of the fibers before they are spun into yarn. Clean fiber can be dyed before spinning it into yarn. This is referred to as stock dyeing. Dyed fiber may then be blended to obtain a yarn with a heather effect, which has many colors of fibers. In order for an even yarn to be made, the fibers must be separated, spread into a uniform thickness, and encouraged to lie relatively parallel with one another. The carding step produces a continuous strand of untwisted fibers that are eventually drawn into a finer diameter strand before twisting the strand into yarn. 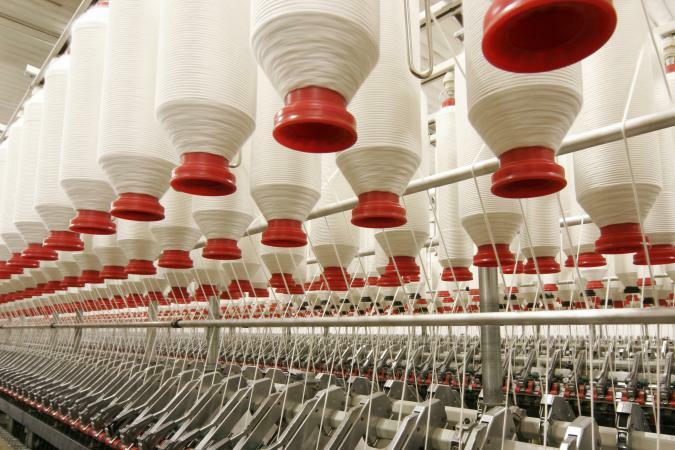 When a soft, fuzzy texture is desired in fabric, the woolen system of yarn production is used. In this process, the fiber is carded several times. Wool fibers of differing lengths and types may be processed with this system. Cloth made from yarn spun on the woolen system is correctly referred to as woolen. Typical fabrics include tweeds, sweater knits, and flannel. In order to get a smooth and uniform textured fabric, the fiber must go through the combing process. Combing makes the fibers straight, in a parallel order. It removes short fibers and almost all of the foreign matter from the fiber matrix. Combed yarns are finer, cleaner, stronger, and more lustrous than carded yarns. Examples of worsted wool fabrics are gabardine and serge. The final step in the process of making yarn is spinning. This draws out the fiber mass, thinning it to the desired diameter, and then stabilizes the strand by twisting the fibers into a yarn. Coloring the wool in the yarn stage before it is woven or knitted into fabric is called yarn dyeing. Dyed yarn produces plaids, checks, and other color-effects in weaving and knitting. Interlacing two or more sets of yarns at right angles to one another forms a woven fabric. Both woolen and worsted yarns can be used in the weaving process. Fabrics made with woolen yarns can be classified as woolens, and those made with worsted yarns may be classified as worsteds. Inter-looping one yarn or a series of yarns forms a knitted fabric. Either woolen or worsted yarns may be used in the knitting process, but woolen yarns are most commonly used. Garments may be knit into shape or flat knitted fabric can be created, which must be cut and sewn into a garment. After a fabric is woven or knitted, pieces of a fabric can be immersed in a dye bath to give color to that fabric. Piece dyeing generally results in a solid color fabric. If yarns of differing fibers are included in one fabric, multiple color effects are possible. A completed fabric needs additional treatment before being acceptable for use by consumers. Numerous finishes can be done to wool fabrics, including: mending to repair damage done in the weaving or knitting process, wet finishes to control shrinkage and to make the fabric more dense; napping to brush-up a fuzzy surface; and singeing (burning) to eliminate long yarn ends. Wool fabric is given a final press to smooth out the wrinkles from previous finishing processes. The natural qualities of wool are the reason it has been continually used for thousands of years. Its superior properties have not been totally duplicated by textile scientists. 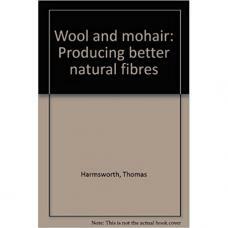 Wool remains a masterpiece of nature and provides a standard by which other fibers are compared. Wool fiber is resilient and elastic. It can bend 30,000 times without breaking or being damaged. Its natural elasticity is due to the cortex cells that naturally coil like springs to form crimp. The elasticity makes it comfortable to wear, because it conforms to the shape of the body and helps wrinkles disappear from wool garments when they are allowed to rest. Wool's resiliency is shown when it stretches and returns to its original shape. Dry wool fiber can be stretched about 30 percent without any damage. Wet wool can stretch between 60 and 70 percent, but is weaker, so washed wool must be handled carefully. The resiliency of wool helps it to wear longer and maintain its good appearance longer than many other fibers. Wool clothing provides superior comfort during both hot and cold weather. Its complex cellular structure enables it to absorb water vapor, but repel liquid. As wool absorbs the body's water vapor, a dry layer of air is left next to the skin to hold in body heat, thereby keeping the body warm. The crimp in the wool fibers keeps each fiber apart from one another, resulting in little pockets of air trapped between the fibers. This trapped air acts as a very good insulator. Wool is comfortable in hot weather because it helps keep the body cooler by absorbing perspiration vapor from the body. The evaporation of perspiration allows the body to naturally cool. The crimp that helps keep the body warm in cold weather blocks out much of the out-door heat with its insulating barrier of air pockets. This helps the body maintain an even temperature. Wool's insulating properties protect against sudden changes of temperature and let the body breathe. While wool can absorb moisture, it repels liquids. The scales on the outside of the fiber keep the liquid on the surface of the wool fabric. If it rains, it will take some time before the raindrops penetrate wool clothing, so wool keeps the wearer drier. When wool eventually gets wet it releases the heat and keeps the wearer warm. Wool can absorb up to 30 percent of its own weight in moisture before feeling really damp. Wool is naturally fire resistant because it absorbs water vapor from the air. While wool will eventually burn, it will not support a flame. Once the flame source is removed, wool self-extinguishes and an ash is left that can easily be brushed away. Wool does not melt when burned, so it won't stick to the skin. Because of wool's ability to absorb moisture from the air, its tendency to build-up static electricity is low. Wool garments are less likely to "spark" and cling to the body. Wool resists dirt and stays cleaner longer that other materials because static electricity doesn't attract dust from the air. Furthermore the scales of the wool keep dirt from penetrating the surface. These same qualities make wool easier to clean. Felting occurs when wool fibers interlock with each other when they are subjected to a combination of heat, moisture, pressure, and agitation. The scales lie in one direction on the fiber, making it move more easily in one direction than another. This is the differential friction effect (DFE). As wool fiber is moistened, rubbed, and warmed, the fibers' scales become locked together. Felting allows wool fiber to be made directly into a fabric without first being made into a yarn. It also allows wool fabrics to be finished with a process called "fulling," a controlled form of felting. "Fulling" makes a fabric thicker and more densely packed. Wool's ability to felt makes it tricky to wash, as heat, moisture, and agitation will encourage felting and permanent shrinking will occur. See also Alpaca; Angora; Camel Hair; Mohair; Worsted. Fournier, Nola, and Jane Fournier. In Sheep's Clothing: A Hand-spinner's Guide to Wool. Loveland, Colo.: Interweave Press, 2001. Harmsworth, Tom, and Graham Day. Wool and Mohair. 2nd ed. Victoria, Australia: Inkata Press, 1990. Kadolph, Sara J., and Anne L. Langford. Textiles. 9th ed. Upper Saddle River, N.J.: Prentice Hall, Pearson Education, 2002. Ryder, Michael L., and S. K. Stephenson. Wool Growth. London and New York: Academic Press, 1968. The American Wool Council. Wool Fabrics Fact Sheet. Available from http://www.sheepusa.org/wool/genwool/woolfabrics.html . Federal Trade Commission. Threading Your Way Through Labeling Requirements Under the Textile and Wool Acts. Available from http://business.ftc.gov/documents/bus21-threading-your-way-through-labeling-requirements-under-textile-and-wool-acts. The Woolmark Company. Natural Properties. Available from http://www.woolmark.com/about/naturalproperties.html .